What Are Stained Concrete Floors? Stained concrete floors are attained by either dyes or stains penetrating into the porous nature of a concrete surface. The staining process will depend on the type of finish desired and the budget of the project. Basically, there are two types of stains, reactive and non-reactive. Reactive stains are usually acid-stained concrete and are designed to react with the concrete floor creating a mottled look which is permanently etched into the concrete surface. An acid-stained concrete is a chemical reaction between metallic salts in an acidic solution and the lime in the concrete floor. Reactive stained concrete floors are very unique and need to be protected with coatings that can make them look glossy. Challenges with acid-stained concrete floors are the limited color choices. Also, the sealers/coatings that are needed to protect the colors in these types of stains, will need to be stripped and re-applied, adding to maintenance costs. Reactive stained concrete floors are very popular because of their low installation costs, but the long term challenges shouldn't be overlooked if you're looking for long term economical flooring option. Non-reactive stains do not react with the lime in concrete, but rather impart their pigment into the concrete surface through absorption of the pores of the concrete. These types of stains are available in a wider variety of colors, compared to the reactive stains. Non-reactive stains tend to be more uniform and opaque in color, which is quite different than the acid-stained floor, which are more mottled. The application process of a non-reactive stained concrete floor can vary, depending on the type of desired finish of the concrete floor. 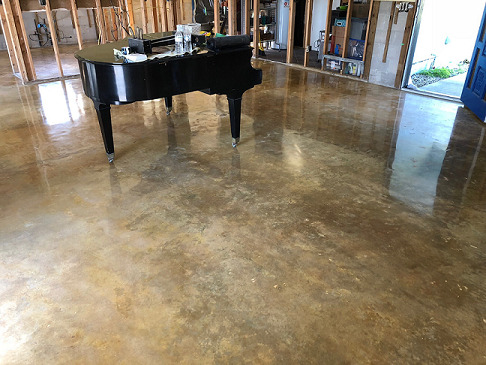 The longevity of a stained concrete floor will depend on the application process and if a sealer or coating is applied after the stain is put down on the concrete. Why Use A Concrete Stain? Using a concrete stain does so much more than just adding color, you are adding to the character of the concrete floor. If you're after a solid color, then painting or adding a colored coating is an option. These have there own challenges, like chipping and peeling, but can viable options if the floor traffic calls for them. Something to keep in mind when considering stained or polished concrete, and that is the history of the concrete floor. What ever has absorbed or any repair that has taken place, most likely will be appparent no matter what ultimately is done to the floor. Staining can hide or blend some of the imperfections, but any repair or discoloration in a concrete floor may still be seen. What some may call flaws now become character, and adding color enhances the character, creating a unique beautiful concrete floor. When using reactive or non-reactive stains, no one can predict exactly what the outcome will be, as there are so many factors that can affect the final look of the concrete. Just know your floor will be the only one of its kind and so embrace its beauty and enjoy the color you choose. A popular look other than just adding color to a concrete floor is the both staining and polishing a concrete slab. This is a look that transforms a dull, dusty ugly floor into a beautiful unique floor that definitely can help with a themed looked. The process uses diamond impregnated metal and resin polishing discs to mechanically polish a concrete surface. The concrete is first prepared with course diamond polishing pads and then stained with the color of choice. Next comes one the most important steps of the staining and polishing process, and that is applying a concrete densifier. Concrete densifiers are applied during the concrete polishing process to harden and strengthen a concrete floor. When staining and polishing concrete floors, densifying will be applied after the stain is added, to lock in the stain. After the floor is densified, the diamond polishing process continues with the very fine diamond pollishing pads. The last step is application of the concrete sealer or concrete guard, which helps protect and preserve both the stain and polish. Polishing a conrete slab to a high polished finish in conjunction with staining, will leave a beautiful floor that is stronger, easier to maintain, and beautiful for years to come. When it comes to stained concrete floor services, terrazzo floor refinishing or just maintaining natural stone, we strive to help educate our customers on the best protection they can have, helping them save time and money in costly refinishing costs down the road. We offer our concrete polishing and staining services in the entire State of Florida, but refinish terrazzo floors, clean tile and grout and natural stone surfaces throughout the Tampa Bay Area of Florida. If you belong to one of the review sites below or just want to find out what people have said about our services, click the badge of the review site below to read more about Integrity Stone and Tile Cleaning Services.